I am working on a history of the word ‘progressive’ in Britain, provisionally entitled Being Progressive: Searching for Meaning in Modern Britain, 1888-2010. Progressive is a very malleable word, with lots of contradictory meanings: moderate and radical; left-wing and centrist; pluralist and partisan. I’m trying to unpick the specific political associations it has from the more general sense of progressing through time – but even this is complex and contradictory: does it mean moderate, gradual change or a radical rupture with the past? I first started thinking about this in relation to the 2010 General Election when (I think for the first time), all three of the main parties were describing themselves as ‘progressive’, but with rather different assumptions about what that meant. David Cameron also described the Coalition as a ‘progressive partnership’, seemingly in a direct challenge to those who think that this is a term associated broadly with the values of the left and specifically with co-operation between Liberals and socialists dating back to the late nineteenth and early twentieth century. I’m now tracing these shifting meanings and uses back into the nineteenth (and even the eighteenth) century, to put it all in a longer perspective and to find out where the boundaries are. Can anything be described as ‘progressive’? Are there particular core meanings which must be there? And, perhaps most importantly, how have the public understood the term? Does it have the same associations for them as for the politicians? 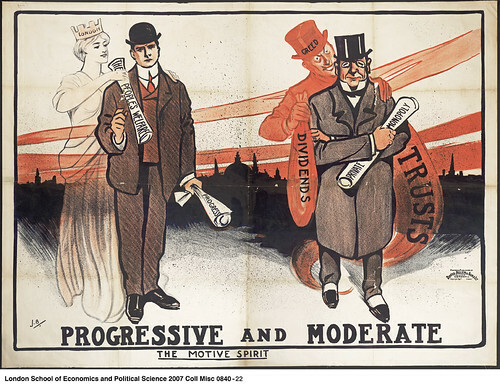 I’m finding that far from emerging in the late nineteenth century, with the alliance between social liberalism and social democracy, ‘progressive’ was already a well-established term by then. Moreover, it was associated with many of the features of economic liberalism which self-described ‘Progressives’ went on to reject. Although ‘progressive’ has since been associated primarily with a centre-left political tradition, it has also remained open to a variety of contradictory interpretations, from communist left to anti-socialist right, and to a wide range of popular applications, from progressive theology to prog rock. This very malleability is revealing. The shifting use of the word tells us a great deal about the ways in which modern Britons have imagined progress – as well as the ways in which they have both sought and resisted it.